Think of Spain and sun, sea and sand springs to mind, but for us it’s the country’s rich and eclectic cuisine that’s a real crowd pleaser. This paella is the perfect example of land and sea working in harmony. Short grain rice infused with Spanish white wine, fish stock and a splash of lemon oil nestling succulent king prawns, chargrilled chicken and smokey Spanish chorizo, seasoned with an authentic mix of herbs and spices. Freezing is nature’s preservative. 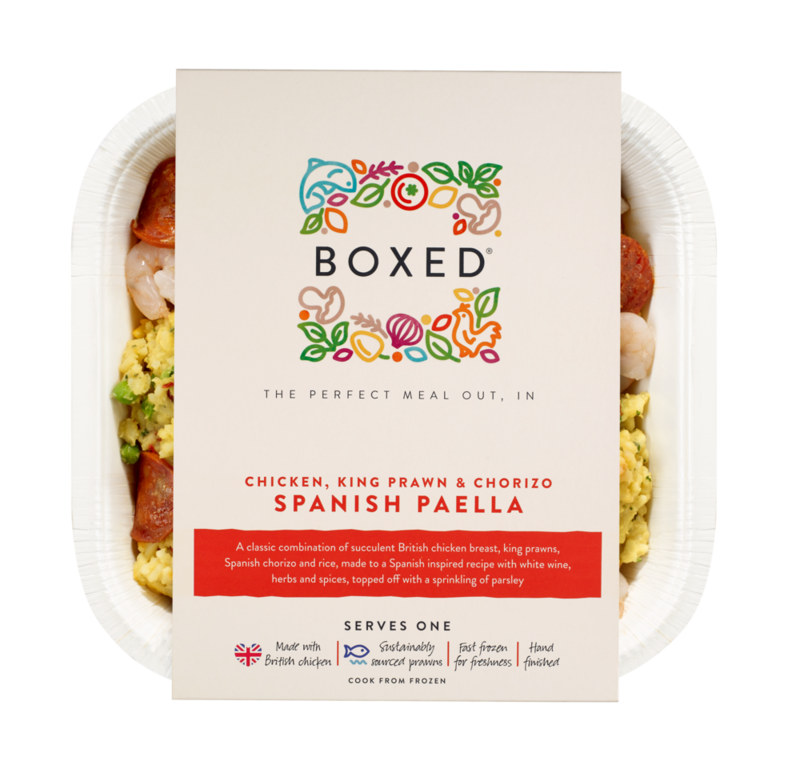 It’s the most natural way of keeping our paella at its best because there’s no need for artificial colours, flavours or additives. It also stops the short grain rice leaching out starch, which gives the perfect texture and bite, and a drier, more authentic Spanish paella sauce. Paella. The sharer’s choice for entertaining your friend, enjoying a dig-in dinner with one of your family or an indulgent tea with your partner. This one has been hand prepared and quickly frozen ahead of time by us, ready for you to cook. But don’t tell them that. For best results, cook from frozen in the microwave. Microwave (From Frozen): Pierce film lid several times. Place on a microwaveable plate. Cook on full power for 850W - 7 minutes, 750W - 8 minutes. Carefully peel back the film lid, stir and re-cover. Cook for another 850W – 6 1⁄2 minutes, 750W - 7 minutes. Leave to stand for 2 minutes. Oven (From Frozen): Pierce film lid several times. Place on a baking tray in the centre of a pre-heated oven 200°C / FAN 180°C / Gas Mark 6 for 45 minutes. Carefully peel back the film lid, stir and re-cover. Cook for another 10 minutes. Microwave (From Frozen): Pierce film lid several times. Place on a microwaveable plate. Cook on full power for 850W - 5 minutes, carefully peel back the film lid, stir and re-cover. Cook for a further 2 minutes. 750W - 6 minutes, carefully peel back the film lid, stir and re-cover. Cook for a further 3 minutes. Leave to stand for 2 minutes. Oven cook (From Frozen): Pierce film lid several times. Place on a baking tray in the centre of a pre-heated oven 200°C / Fan 180°C / Gas Mark 6 for 25 minutes. Carefully peel back the film lid, stir and re-cover. Cook for a further 15 minutes. — Don't forget the lemon! Put 150g of olives (the larger the better), 2 cloves of peeled garlic, 3 tbsp. of extra virgin olive and ½ lemon (just the peel, grated) in a jar and leave to marinade for a minimum of 2 hours before serving. Pre-heat oven to 200C / Fan 180C / Gas mark 6. Chop 4 medium bell or sweet peppers in half, remove the stalks and de-seed. Lay cut side down on a lined baking tray and bake for 25 mins until tender and slightly charred. For the dressing, whisk together 1 tsp. extra virgin olive oil, 1st. lemon zest, ½ tsp. red wine vinegar & 1 tbsp. rinsed capers until combined, and season to taste. Leave peppers to cool slightly before drizzling over the dressing. Top with a handful of fresh basil leaves and serve. A bold dish calls for a bold-ish wine. We recommend a Spanish red wine from the Rioja region. Its sweet, peppery notes stand up well without overwhelming the paella’s big, bright flavours.